Cathedral of Christ the Saviour in Moscow, the tallest Orthodox church currently (103 m). 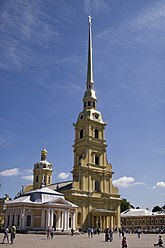 Peter and Paul Cathedral in Saint Petersburg, with its tallest Orthodox bell tower (122 m). 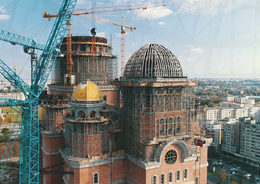 People's Salvation Cathedral in Bucharest, the tallest Orthodox church under construction (135 m). This is a list of tallest Orthodox church buildings in the world, all those higher than 70 metres. Traditionally, an Orthodox church building is crowned by one or several domes with Orthodox crosses on the top of each. The overall height of the temple is measured by the highest point of the cross above the main temple. The number of domes is symbolical. One dome is a symbol of Christ or God, three domes are symbolic of Trinity, five domes symbolize Christ and Four Evangelists, seven domes are often used because seven is a holy number, and thirteen domes correspond to Christ and his twelve Apostles. Other numbers are also encountered. An Orthodox church building may also have a bell tower or zvonnitsa, either a part of the main church building, or standalone structure. Typically, bell tower is higher than the main temple. This list is divided into two sections, one listing the highest temples and the other listing the highest bell towers or zvonnitsas. 19 79.9  Dormition Cathedral in Astrakhan Kremlin The height of the bell tower is 37 sazhen. ^ Nave+Cross= 87.1 m. The height of bottom floor (underground chapel) is 13.1 m. There is some dispute over the height of the top cross. The look of relief will be calculated as a whole, not just a small part. The eastern side is raised and lowered in the west (River Kura). We have 80% of the side "level ground", and 20% "slope". These 20% are leveled with the rest of the territory. 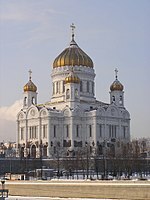 This case is similar to the Cathedral of Christ the Saviour in Moscow (the height of bottom floor is 17 from River Moscow). In this case the height bottom floor, not be taken into account.